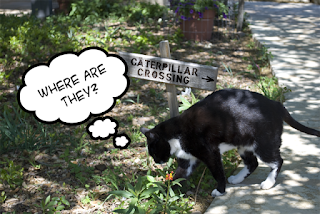 Dear Bootsie: When are the Butterflies returning to the Inn? Dear Guest: I went looking for caterpillars yesterday but I didn't find any.The Monarchs should be returning shortly, along with all of the other beautiful species. I just love laying in the courtyard and watching all the pretty butterflies pollinating the flowers.